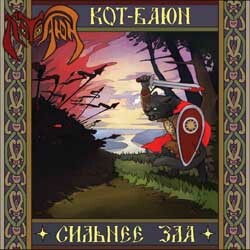 Russian folk metallers Кот-баюн (Kot-Bayun) will soon release their debut full-length album entitled “Сильнее зла (Stronger Than Evil)” via SoundAge Productions. Release date and pre-order info will be available shortly. Kot-Bayun is mystery cat from Russian fairy-tales. According to these tales he is not a home kitty, he is a dangerous cat with sweet voice. He lives in a dead forest without birds and animals, usually sitting on a big column. He begins to speak with you, telling fairy-tales and he sings to make you sleep and then he will kill you. If you can resist and catch him, you’ll get powerful health and Kot-Bayun will solve you forever. The band Кот-баюн was formed in 2011 and released the 4-track EP “Было время…” in 2013 via Sublimity Records. The upcoming full-length was recorded, mixed and mastered by Dmitriy Mashkov (Arktida Records). The band has unveiled the cover artwork, designed by Tsukanova Oksana, the album tracklist and a video teaser for “Сильнее зла (Stronger Than Evil)” that you can watch below.